Some days ago, I got annoyed with that, everyone couldn’t pick up my iPhone and start messing with Voice Control. And because I never use (or will use) this feature, I took journey to turn it off, ones and for all. And after quick restart, no one could open Voice Control, because it crashed before any harm could be done. Excellent! If you want something to work as it should, write it yourselft. Commentcloud - Hides Soundcloud.com comments by default, after page is loaded (hate those things!). Should work on Firefox, Google Chrome, Opera. You will need to install Greasemonkey add-on. After that just open bytingshark.user.js and install it. Just open bytingshark.user.js and it should prompt install wizard. This is my latest, handy weekend project for Grooveshark - Bytingshark. The main goal of it was to be able easily see playing songs mp3 file size. From that you can assume files sound quality and that just what doctor prescribed. Enjoy (but be aware, it might contain some bugs)! And if you feel like poking around in source code, you will like this link. P.S. 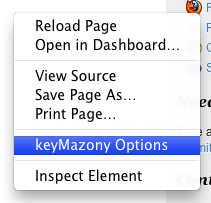 You can find keyMazony Options page in Safari by doing right click in any web page and selecting “keyMazony Options” item.